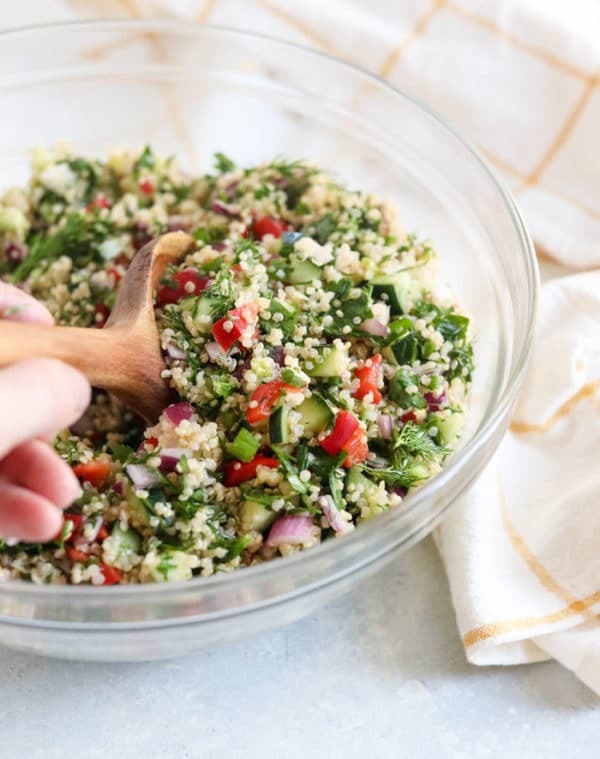 This Vegan Quinoa Salad is one of my favorite make-ahead lunches. I love how it’s loaded with a variety of crunchy veggies and is a complete source of plant-based protein! Despite it’s reputation as a “super grain,” quinoa is not technically a grain, it’s a seed. This particular seed happens to be a complete source of protein, containing all nine essential amino acids that the human body can’t make on its own. Quinoa is also a great source of iron, magnesium, vitamin B2, and manganese, which are all necessary for healthy brain function. 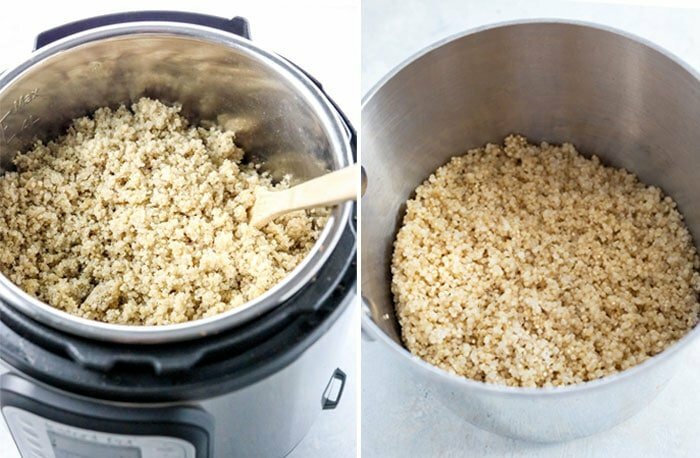 Lately, I’ve been making quinoa in the Instant Pot to make the process 100% hands-off, but feel free to cook it on the stove, if you prefer. Combined with an assortment of fresh herbs, quality olive oil, and chopped vegetables, this salad is bursting with flavor! It’s one of my go-to recipes when I need a large salad to bring to a potluck or party, but I also make it regularly as a packed lunch. I love how the sturdy veggies hold up well in the fridge for several days, and that it’s hearty enough to keep me full for hours. You can always add in some cooked chickpeas or other beans for extra plant-based protein, too! Making this vegan quinoa salad is as easy as it gets. All you need to do is cook batch of quinoa, chop some veggies, and assemble it all with a light dressing. 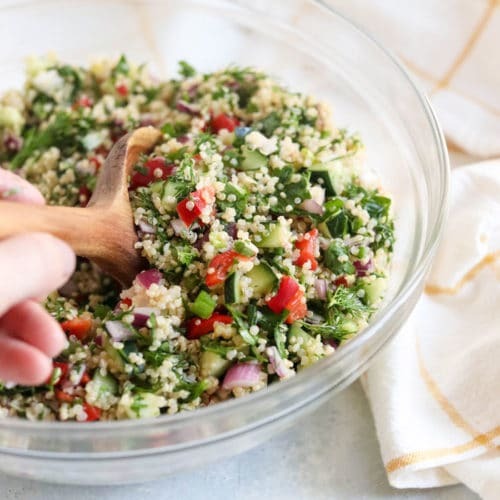 Once the quinoa is simmering away, you can multitask by stirring together the dressing in a large bowl and then chopping the veggies and adding them to that bowl as you go. By the time the quinoa is nice and fluffy, most of the effort should be done– all in less than 30 minutes! 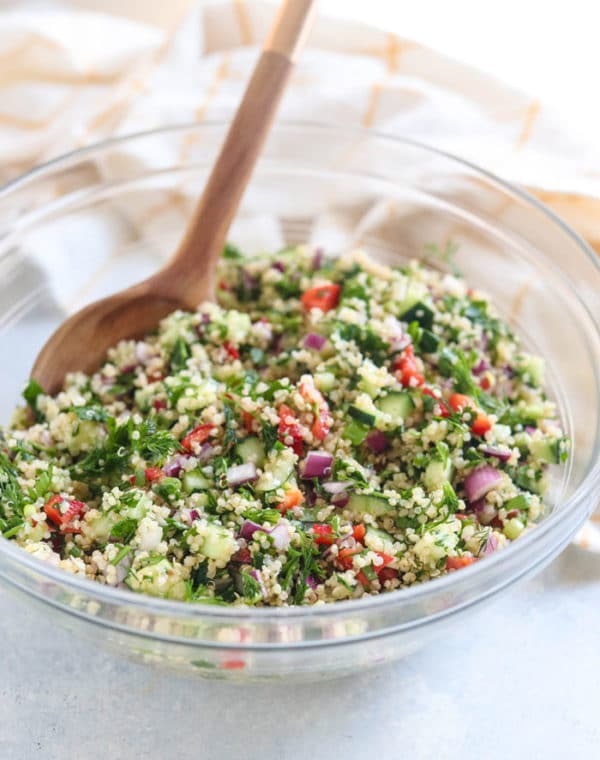 This VEGAN QUINOA SALAD is my favorite packed lunch, loaded with plant-based protein. Easy to make with lemon juice, fresh herbs, and crunchy veggies! In the meantime, mix together the lemon juice, olive oil, 1 teaspoon of sea salt and fresh black pepper in a large bowl. Add the cooked quinoa, and toss in the dressing to coat well. Allow the mixture to marinate at least an hour before serving, or chill in the fridge overnight. This salad can be served cold or at room temperature, and should keep in an airtight container in the fridge for up to 5 days. This salad is perfect for proper food combining (as a starch meal), but if you’re not vegan you can add a sprinkle of feta cheese or your favorite protein on top. My husband likes it with shrimp or chicken added. If you don’t tolerate quinoa well, I imagine you could use any other grain you like, such as brown rice or millet. You could even use pasta instead, for a healthy pasta salad! Reader Feedback: Are you a fan of pasta salads? Any favorite combinations you love? This was easy and so yummy! I’m not a vegan but need something to bring to a gathering that everyone could eat. This is definitely becoming a staple in my weekly meals. Thanks! I’ve been eating this for lunch all week long. SO good! I made it just as written this week, but I’ve added beans to it before, too, and it’s good either way. Wow, I can’t get over how much flavor this salad packs! It’s so easy to make, and I just keep going back for more. I’m not vegan, so I have been adding a little feta cheese on top, but it doesn’t need it. So good! Thanks for another favorite. I really love this quinoa salad!! It is so fresh and delicious! It’s great for a healthy and nutritious lunch idea. Now that I have an Instant Pot I will be making my quinoa in it while prepping the veggies and dressing. Try this!! This is very similar to the Greek Quinoa Salad I made this weekend. I used cucumber, cherry tomatoes, onions, scallions, and olives. This sounds even better with the red pepper and parsley! This is my all time favorite way to eat quinoa! I’ve made this many times and love it so much each time. Even my 2 year old loves it. All the fresh ingredients are very refreshing. Just wanted to comment and say thanks. Thank you for this amazing recipe! I used whole wheat orzo pasta and added a can of garbanzo beans and a can of artichoke hearts. It was soooo good! So delicious! The first time I’ve had quinoa and actually enjoyed it! I’ve made sooo many of your recipes but I don’t think I’ve ever commented! Made this tonight for the first time and we LOVED it! Any idea how much already cooked quinoa to use? I have a bunch of plain cooked quinoa in my fridge! My best guess is that 1 cup of dry quinoa equals roughly 3 cups of cooked quinoa. Costco has PITTED kalamata olives that are amazing! Red wine is part of the marinade. me for bites and were claiming the leftovers! Success! I’m converting people to our healthy eating all the time! I added carrots, celery and some garlic powder. I also added some spinach and baby kale. I put it into my processor to shred it small and to pack in even more vitamins! My friends were begging me to make more! I forgot to add: five stars! I made this tonight. For those of you with Trader Joes in your area, just this year they started selling pre-cooked quinoa in their frozen section. You get two packets (about a cup each) in a paper box, and I used this tonight. I added a little wild rice I had leftover from another meal. I found the Castelvetrano olives in the olive bar at a local Whole Foods (unpitted). I left them with the pits in since I won’t be feeding this to guests–yet, but I also have a cherry pitter which is a good olive tool, as well. I tasted a few spoonfuls before putting the salad in the refrigerator and to me, it is a perfect summer salad whose motif is “freshness.” I also used the tinier Persian cucumbers (which I find more flavorful,) and I purchased a pre-package of six of those at Trader Joe’s. One thing I’ve noticed about the recipes I am finding on here: so many of them are adaptable, as this one is, to adding or subtracting as you desire. I think when I have another helping of this tomorrow, I will add feta crumbles and grilled shrimp. Tiny tomatoes would also be wonderful. SO SO DELICIOUS! I used wild rice and omitted the red pepper. My husband enjoyed this recipe as well (he is an extremely picky eater!) One of my favorite healthy recipes of all time! Thank you! 5 stars!!! This recipe looked really interesting and I was wanting to try it. But I went in to Wal-Mart and found that 16 oz of quinoa was a$6.98. Rib eye steaks were less expensive. I’ll check Sams and Costco, but I won’t pay more for quinoa than I do for sirloin steak. This looks fabulous! Ny chance you can tell me how much sodium per serving? Just was told I need to be low sodium and would like to see if this fits in my daily regimen! Another awesome recipe. I don’t think I’ve ever been to a website that has had so many consistent great tasting, healthy recipes. So far I’ve made your Broccoli soup, Vegetarian Masala, Potato Salad and now this quinoa. Bravo to you Megan. All amazing recipes. I would SO buy your cookbook if you ever had one. I made this salad and loved it! I did notice that there were no instructions as to when to add the red onion and since there was also green onion I wasn’t sure if it was a misprint and it was supposed to be one or the other. Anyway, I left the red onion out and it still tasted magnificent. Actually, after a couple of days the onion flavor from the green onions stood out enough that I don’t think the red onion was needed. I made this for dinner last night, it is so good!!! I omitted the onion and olives based on personal taste. I’ve had quinoa a number of times before but never really liked how it was prepared. This is def going to be a go to recipe now! Thanks Megan!!! I just made this today (yes for Easter Sunday!) and it was fabulous! I didn’t have dill and used half the salt, it was fantastic! It reminded me of tabouli, so I think adding mint would be nice. I want to make this right now! Thank you for sharing this recipe! I’ve been searching for something good to bring to Easter dinner and this will be a perfect dish. Yum! I love pasta and love quinoa so will definitely have to try this recipe. It sounds delicious! Just made this salad last night, and I am beyond IN LOVE with it! Cannot wait for lunch to eat this again, since the flavours had time to marry over night 🙂 Thank you for the recipe! Just made this salad this morning and its very tasty! Thank you! I made this last night and it was SO GOOD! My husband just had some of the leftovers with his breakfast, that’s how good it is! I used a quinoa/wild rice blend, which worked perfectly. I also added some crumbled feta and sliced grape tomatoes. Just so delicious, thanks Megan! Delicious! I made it last night and took it to a luncheon today. It was a hit. I think I like it warm or room temp, best. It reminds me of a Greek salad (without the feta). The fresh olives are a must! I’ve made this exact salad in the past with quinoa as I’m always looking for a “good” pasta alternative and quinoa fits the bill! Try it with some soaked raw nuts to add another layer of taste and some crunch. I’ve also added dried fruits (mango, cherries), would that keep it properly combined? Sounds great about adding the nuts. How long and what kind of nuts would you use? This looks great..I am huge fan of preparing pastas like this in advance and taking them in my lunch. Funny that you used quinoa in this recipe, because I was going to ask if you every use the grain-like seeds like quinoa or millet in your recipes? Have you tried sprouting quinoa before? Sprouting quinoa sounds interesting… what are your favorite ways to cook/serve quinoa after it has sprouted? Im definitely trying this with cali rice! Can i replace the lemon juice with vinegar? I’m looking forward to making the quinoa salad and also the frozen bananas! I’m going to make it when we get together with our 4 adult children. They enjoy eating gluten-free! Thank you! Macaroni salads are my favorite thing closest to pasta salads! How do you feel about polenta? I just discovered it recently and am curious if you have any good recipes ? Oh I’ve made quinoa like this before while just messing around in our kitchen! It put golden raisins in it too. There were no olives and red pepper in mine though which would be awesome! I really like the way this recipe sounds can’t wait to try it! This looks so delicious! I will definitely be making it!